Posted on Alliance of Middle East Socialists June 13, 2018. The mass protests that began in Iran on December 28, 2017 and have continued in the form of smaller nationwide protests and strikes, have been unprecedented in scale since the 1979 Iranian revolution, a revolution that was soon transformed into its opposite, the Islamic Republic. The December protests that were started by mostly unemployed youth in smaller cities demanded the overthrow of the Islamic Republic and the withdrawal of Iran’s military and paramilitary forces from Syria, Lebanon, Iraq and Yemen. They were preceded by over a year of persistent protests among workers, teachers, nurses, retirees, as well as hunger strikes by political prisoners and years of various forms of women’s struggles against gender discrimination. They were caused by economic, political and social reasons and were the product of the dissatisfaction of a young, literate population that is connected to the world through the Internet and is fed up with poverty, repression, gender and ethnic discrimination as well as discrimination against religious minorities. The focus of today’s presentation is on labor protests because at this moment there are nationwide labor strikes/protests taking place in Iran that do have the potential to move Iran in a revolutionary direction. At the same time these protests face various internal barriers as well as external barriers: A repressive capitalist regime, the threat of imperialist wars from the U.S., Israel and Saudi Arabia, and the existence of patriarchy and discrimination against oppressed minorities. As socialists, we need to understand the scope and depth of these labor protests, and help them overcome their barriers. More than 50% of the population of 82 million live under the poverty line. 90% of the 13 million Iranian workers who are covered by the labor law are contract workers with few rights and benefits. While the official workforce is estimated at 28 million, millions work unofficially without any rights. The real unemployment rate is over 40%. The minimum wage of $200 per month (which is less every day with rising inflation) is one-fifth of the poverty line for a family of four. Currently there are nationwide strikes in progress by railway workers and truck drivers. Teachers and healthcare workers are protesting everywhere. 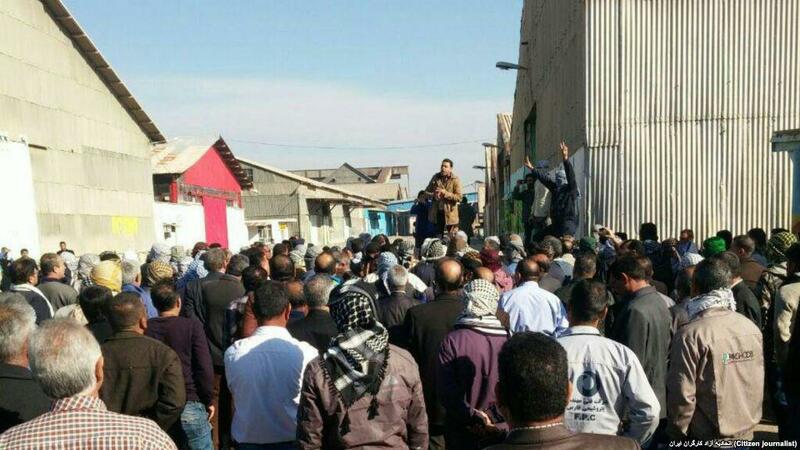 There is an ongoing strike by 4000 Ahvaz (Khuzestan) steel workers which has led to marches around the city by workers and their family members, attacks by anti-riot police and arrests of 50 workers. There are on and off strikes by Haft Tapeh Sugar Cane workers and oil and petrochemical workers also in the province of Khuzestan which has a large ethnic Arab population that faces discrimination. HEPCO heavy equipment production workers in Arak(Central Province) faced a lockdown and arrests after staging several strikes and sit-ins. Kurdish Koolbars (workers who carry cargo on their backs) on the Iraq-Iran border have been protesting against the closing of the border. Most labor actions are protesting the non-payment of wages, non-payment or lack of health insurance benefits, and lack of job security. Many are protesting what they call “privatization” of government owned enterprises. The lack of safe working conditions, the low quality of education and the terrible quality of healthcare are major problems. Farmers are demanding water rights to irrigate their crops and are deeply concerned about the very serious water shortage caused by the building of dams (not only in Iran but also in Turkey and Afghanistan), the diversion of water reservoirs to other cities, as well as other environmentally damaging government policies and practices. Their demands also highlight the important environmental dimension of the current labor protests in a country that is on the verge of environmental collapse. Most of the factories and industrial complexes in which strikes and sit-ins are taking place are immensely in debt. They have limited production and are in a way out of the game. The Iranian economy is not as dependent on these dying factories. They represent a very small percent of the gross domestic product. Hence the regime does not care if they stop producing. However, the regime can decide to repress the protests much more brutally if production in more valuable enterprises is at stake. Hence, when the truck drivers – whose role is vital to the economy and living conditions – started their nationwide strikes last month, the government’s response was much more severe, and a lot more concern was expressed by regime officials. Strikes among workers in the oil industry or large companies such as SAIPA, Iran Khodro (automobile production) or steel production factories in Isfahan can have the same impact. Some international labor activists might be familiar with the names of labor leaders such as Reza Shahabi of the Syndicate of Workers of Tehran and Suburbs Bus Company who had been in and out of prison for the last six years, suffered from beatings, solitary confinement, various hunger strikes, and was released on parole in March. The fact that he was released showed that the current protests and the international solidarity from various labor activists and labor organizations around the world who called for his release, have made a difference. He and two other labor leaders, Davood Razavi and Loghman Veisi visited Europe last week at the invitation of several French syndicates. They protested the International Labor Organization’s recognition of Iran’s state-sponsored unions and called for the recognition of independent labor unions. Shahabi is opposed to capitalism and was one of the few labor leaders who in 2013 in a statement from prison, opposed not only U.S. economic sanctions and war threats against Iran, but also Iran’s military intervention in the region. The above mentioned developments in addition to the participation of women and members of oppressed national minorities such as Kurds and Arabs in nationwide protests all show that these protests have the potential to go much further and deeper. At the same time, although the right-wing populist forces of Ahmadinejad and the pro-U.S. imperialist Mujahedeen are still too discredited, the secular nationalist and pro-U.S. imperialist monarchist opposition do have some appeal among the masses. Secular nationalists and monarchists speak of fighting corruption, ending inefficiency and replacing this regime with a secular and efficient state that would give women their civil rights and stay away from military interventions abroad. Nationalist slogans such as “Face the Motherland and Turn Your Back to the Enemy” are being used at some labor protests. What Are the Barriers to a Revolutionary Socialist Direction? The problem we need to face is that while the demands of the current protests have the potential to create the basis for a revolutionary socialist movement, an explicit articulation of socialist content is missing from the protests. There are various reasons for this. The Islamic Republic has used the language of “revolution,” “anti-capitalism” and “anti-imperialism” from its inception. Furthermore, during the 1979 revolution, the majority of Iranian socialists who were followers of Stalinism and Maoism, discredited socialism and Marxism by supporting Khomeini as an “anti-imperialist.” Soon, many socialists were executed by the regime, or were driven into exile and became disillusioned. Even now the positions of most Iranian socialists and Marxists on the two key issues raised by the December-January mass protests have been very problematic. Most Iranian socialists have refused to take a position against Iran’s military interventions in the region. On Syria in particular, they either supported Assad or called him “the lesser of the two evils” in comparison to ISIS. At most they have attributed Iran’s military interventions only to ideological motivations for expanding Shi’a Islam. They have not addressed the connections between the strategic interests of Iranian capitalism, its militarism and its regional imperialism. Most Iranian socialists limit capitalism to the private ownership of the means of production and view a state-owned economy as a progressive alternative. They trace the roots of the current massive decline in the standard of living to what they call “privatization.” Since 2005, the bulk of the state’s assets have been transferred to parastatal organizations such as the Islamic Revolutionary Guard Corps and other religious foundations, in order to allow the state to avoid paying the meager benefits that it is required to provide for its employees. State employees have been fired and rehired by parastatal contractors who only hire contract workers and pay few or no benefits. The bulk of the economy however is still directly and indirectly controlled by the state. Instead of seeing Iran’s economy as state capitalist, most socialist economists claim that it is private capitalist. They do not support the Islamic Republic but see more state ownership and state intervention as the solution. In contrast to these views, some socialist and Marxist labor activists, especially among the younger generation, are discussing alternatives such as workers’ cooperatives and workers’ councils. Some Marxists discern the limitations of workers’ cooperatives and emphasize that even workers’ councils can only be effective if they overcome capitalist alienated labor, its mental/manual division of labor as well as patriarchy, sexism and heterosexism. They recognize that overcoming capitalism goes far beyond workers taking over the workplace and requires ending the capitalist mode of production globally through international revolutionary solidarity and global coordination. These are the socialist voices inside Iran that offer the most hope at this time. To sum up, the mass protests that arose in Iran in late December and have continued in the form of labor strikes, protests of women for their rights and protests of oppressed national minorities against discrimination, offer tremendous potential for revolutionary developments. However the regime is using the threat of U.S., Israeli and Saudi Arabian imperialist intervention to crush them. The nationalist opposition forces who support western imperialist intervention are using the promise of a secular, efficient and non-interventionist capitalist state to divert the movement. What Kind of International Solidarity Is Needed? The Alliance of Middle Eastern socialists is trying to reach out to anti-authoritarian and humanist socialists from around the world to seek solidarity with these struggles. We need to oppose the repressive Iranian regime, oppose the imperialist war threats against Iran, support the above discussed protests/strikes, and promote debate on a humanist alternative to capitalism. Protest Trump’s, Netanyahu’s and Ben Salman’s war threats and economic sanctions against Iran. Challenge their lies and rhetoric. Their imperialist war on Iran will bring nothing but more death and destruction for the Middle East region, and misery and repression for the rest of the world. Write a letter to the Free Union of Iranian Workers (http://ettehad-e.com/) at k.ekhraji@gmail.com , or to the Syndicate of Workers of Tehran and Suburbs Bus Company ( http://vahedsyndica.com/) at vsyndica@gmail.com, express your opposition to imperialist war threats and support for their demands and protests. Say how you think labor struggles in your country and Iran can speak to each other and help each other. If you work with a labor union, organize a meeting to discuss how you can express your solidarity with Iranian labor protests. Reprint the article below on how U.S. teacher protests can learn from Iranian teacher protests. Call for the immediate release of the three imprisoned leaders of the Teachers’ Union, Esmail Abdi, Esmail Abdi, Mahmoud Beheshti Langeroudi and Mohammad Habibi. Express your solidarity with the Girls of Revolution Avenue, some of whom have received long prison sentences for opposing the compulsory hijab. Abdi, Esmail. “Teachers’ Rights Advocate Writes Scathing Letter From Prison on Revolutionary Iran’s Failed Promises.” Center for Human Rights in Iran, April 12, 2018. Hakimi, Mohsen. The Transformation of Marx’s Communism: From an Anti-Capitalist Working Class Movement to the Ideological Party of State Capitalism. Tehran: Akhtaran Press, 2017. Maljoo, Moammad. “Privatization: The Direct Barrier to Liberation.” Meydan, September 2016. Zamaneh’s informative and daily reports on Iranian labor strikes are too numerous to cite. Feature image: Police arrested more than 30 protesters on the fourth day of a strike by hundreds of workers on February 4, 2018, at Haft Tappeh, a major sugar plant near the city of Shush, in Iran’s Khuzestan Province.